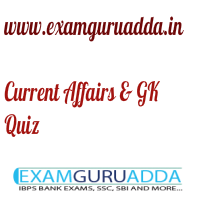 Dear Readers Examguruadda.in presents Current Affairs Quiz Questions and Answers of 13-14 February 2017 that cover important current affair events. Current Affairs quiz for IBPS PO,clerk, RRB-Po,Clerk, SBI, NIACL,Railways and SSC Exams. 1. Jiro Taniguchi, who passed away recently, was the legendary comic manga artist from which country? 2. In which state the 2017 UNESCO Natural Heritage festival was held? 3. Which city is hosting India’s first-ever International Table Tennis Federation (ITTF) World Tour event? 4. Which warship has become the India’s first warship to install solar panels on board? 5. Which state government has observed “Parents’ Worship Day” on February 14? 6. What is the theme of 2017 BRICS Summit? 7. Which country is hosting 2017 BRICS Summit? 9. In which state India’s first-ever floating elementary school has started? 10. Who is the author of the book “Welcome to Nowhere”?